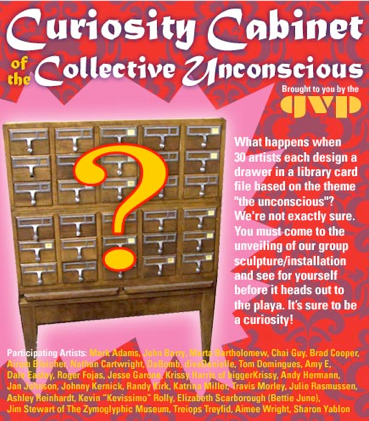 In today’s episode, we speak to Treiops Treyfid about a collaborative art project produced by the Good Vibe Posse entitled “The Curiosity Cabinet of the Collective Unconscious”. 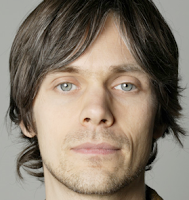 Treiops produced a series of recordings of people’s dreams for this project. Only 27 days left ‘til Burning Man! 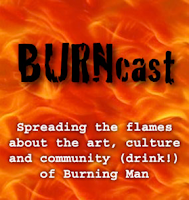 BURNcast will attempt to produce one more episode prior to Burning Man. We ask that if you’ve been listening to this show to please make a small contribution to the BURNcast production budget to help enable us to record podcasts at Burning Man. I need of 1 GB mini discs and some better microphones. Or if you have recording expertise, I would love your assistance at event. In addition to BURNcast, I am producing “Ouija Says” an interactive art project that will be mapped in the “Who What When Where” and located somewhere between the 4:00 radius and the man. At the time of this recording, I am still trying to raise funds for this project through the sale of furry playalicous playwear and hoops at the Ouija Says Freak Boutique, which can be found on the website. For Burning Man 2006, I have a few things planned. First is Tu-Tu Tuesday, taking place on Tuesday August 29th in which I ask all citizens of Black Rock City to don a tutu and drink a toast in solidarity for “community”. On Wednesday, August 30th, I will be recording a podcast at the Spoken Word Stage in Center Camp from 2:00 p.m. to 3:00 p.m. and I invite all our listeners to come and join us and again, drink a toast to “community”. Then on Friday, September 1, 2006 from 7 to 10 p.m. I will be holding a BURNcast Meet and Greet Party in which guests of our show and listeners can come together and drink a toast to community (hiccup!). The party will take place Gnome Camp located 4:30 and Destiny within New Amsterdam Village. Burning Do-Gooders is an LA-based collective of DJs, promoters, artists, performers, musicians and activists dedicated to putting the creative and constructive spirit of the Burning Man community to work in the so-called "real world." They are affiliated with Burners Without Borders, a group that brings together like-minded Burners to work for positive change in communities that need our help, hope, financial support and elbow grease. The first project of the Burning Do-Gooders is an event entitled “Good One” to benefit My Friend's Place, a day center for homeless youth in Hollywood that provides meals, job training, health and social services -- and classes in juggling and stilt-walking. The event took place on Sunday, July 30th at the Mor Bar (a burner based business) in Santa Monica and features DJs, live entertainment and a silent auction. Future projects for Burning Do-Gooders may include other fundraiser events, art auctions, beach clean-ups -- you name it! In fact, if you have any ideas for future Do-Gooder activities, let them know. Especially if you can help us make it happen. Today’s guests are DJ Poncho Andy, the founder of Burning Do-Gooders and Katie Bone, the Director of Special Events of My Friend’s Place.